Hello to all my fellow Netflix binge watchers. Stop your scrolling and trolling because your newest obsession has arrived. 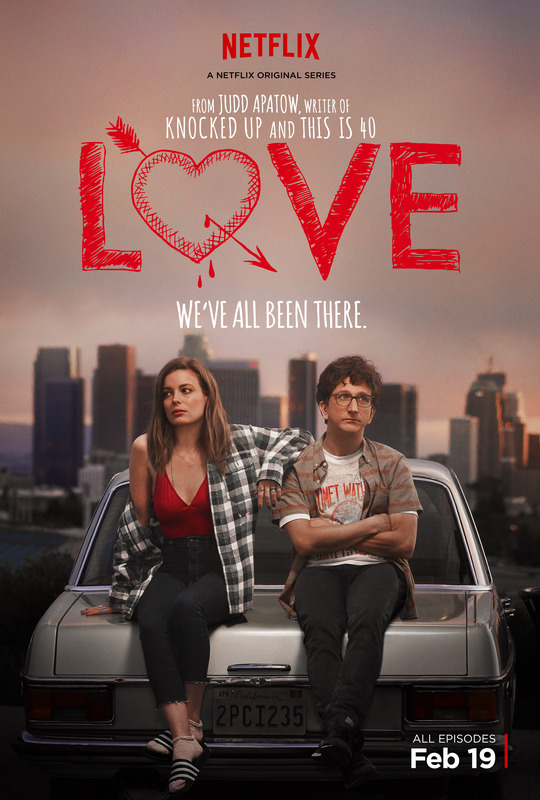 Love, a Netflix original created by Judd Apatow, Paul Rust and Lesley Arfin is a quirky and unique story following the awkward, emotional and entertaining lives of two thirty somethings as they struggle with happiness, stability and -yes, you guessed it- love. Netflix premiered the 10-part series on February 19. Love is a sort of romantic comedy turned on its head. It is not another cliche story of picture perfect people with picture perfect lives, but instead gives an unpolished look at love through the eyes of the two unconventional leads. Screen time on Love switches back and forth between awkward nice guy with a tendency for babbling Gus (Paul Rust) and volatile alcoholic and drug-addict Mickey (Gillian Jacobs). Gus works on a TV show set called Witchita (think Vampire Diaries meets Gossip Girl) as an academic tutor for the child actors on the show, but clearly dreams of working as a screenwriter. Mickey works on a satellite radio show where a pompous doctor doles out life advice to listeners. Her character is constantly switching back and forth between self-destruction and self-improvement. Love is the classic story of boy meets girl. AKA boy goes to a grocery store where girl is yelling obscenities at the cashier for not giving her coffee. Boy then buys girl coffee so cashier won’t call the police on her. Classic stuff right? It is a genuinely charming and funny series that does a good job of not taking itself too seriously. Apatow (Girls, Knocked Up, Freaks and Geeks) has a well-earned reputation of crafting sincere stories blended with offbeat comedy. Much of the humor in Love is not obvious. It’s not just jokes and one liners like so many sitcoms, but awkward interactions, absurd situations and endearingly obtuse characters that make this show stand out. I would have liked to see slightly more consistency in the characters and the comedy. Occasionally the jokes fell flat and some of Mickey and Gus’s actions in the later episodes felt a bit out of character for their established personalities. All in all though Love gets two thumbs pointed way up. The subtle humor and honest dialogue score this show an 8/10 rating by me. The series is a critical success. Scoring an impressive 88 percent on Rotten Tomatoes, Love has secured its rank among the best of Netflix originals. Just days after the first season debuted, a second season has already been secured. You’ll have to wait a year, but 2017 will see 12 more episodes of Gus and Mickey’s antics coming to a Netflix screen near you.